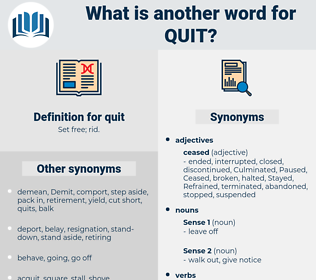 What is another word for quit? discontinued, retired, sat, terminated, suspended, Vacated, Caught, Renounced, Refused, divorced, postponed, Returned, continued, dispensed, Commencing, Stipulated, Fought, halted, lifted, rejected, promulgated, graduated, Ditched, determined, bested, finished, Became, defected, Deported, lost, Skipped, finalized, Disproved, Stepped, Detained, Shifted, decided, Gave, assaulted, defeated, Fled, Threw, failed, Died, Gouged, dropped, Tackled, included, derived, deserted, moved, Emerged, broke, lit, Knocked, wasted, Sailed, released, pulled, ruled, dumped, defined, traded, Wavered, Stood, Jumped, laid, Rode, kicked, Walked, planted, marooned, Underwent, fell, Allowed, Warned, Messed, kept, Ran, Reached, Did, based, exited, exits, stop, arrested, arrests, departed, surrendered. discontinued, retired, withdrawn, relinquished, forfeited, terminated, interrupted, Disappeared, Abdicated, dismissed, cancelled, Omitted, decommissioned, Eliminated, suspended, Vacated, removed, utilized, Caught, discarded, Renounced, Switched, Desisted, Curtailed, Returned, continued, foregone, Instituted, forgotten, dispensed, exploited, excused, Abolished, suppressed, Subsided, halted, Displaced, increased, rejected, Forgone, Deleted, discharged, established, neglected, Forgiven, Waived, expired, Declined, frozen, Ditched, scrapped, maintained, Denounced, Captured, scheduled, determined, finished, Sacrificed, apprehended, settled, Forsworn, lost, Skipped, finalized, Detained, Shifted, finalised, decided, overlooked, separated, jilted, confined, Aborted, Fled, seized, formulated, failed, reversed, dropped, Tackled, included, changed, derived, elaborated, Remained, broken, stoned, deserted, fixed, moved, sworn, Emerged, convicted, Been, Stalled, risen, released, stemmed, pulled, ruled, ended, dumped, defined, Jumped, laid, Devised, Evolved, phased, stranded, beaten, marooned, grown, Flown, drawn, blocked, locked, undone, fallen, attempted, booked, cleared, kept, Reached, Popped, based, exited, arrested, surrendered. retire, terminate, forego, renounce, forgo, waive, stop, discard, abdicate, interrupt, suspend, eliminate, evacuate, flee, denounce, ditch. established, apprehended, Eloped, ended, Ceased. assert, cherish, defend, advocate, undertake, handicapped, prosecute, occupy, haunt, favor, maintain, adopt, keep, claim, uphold, seek, vindicate, encumbered, protect, retain, support, hold, pursue, court. begin, remain, enter, come, persevere, continue, join, allow, DO, finish, stay, come in, complete, arrive. commence, carry on, go, rise, start, initiate. Is he going to quit, too? All I can tell you is, I've given him notice to quit.